Nadam celebrations showcase Inner Mongolia's ethnic culture and offer an ideal opportunity for travelers to explore more of what makes Hulunbuir a winter wonderland. Travelers bundle up so that only their eyes are exposed to the frigid winds-but their eyelashes quickly freeze. Not even hot water stays liquid at these temperatures. Visitors splash hot water into the air and watch it fall as snow and tiny icicles. This is what makes Inner Mongolia autonomous region's Hulunbuir city a winter wonderland for about seven months a year. The celebrated summer retreat is luring more visitors during the cold season. Travelers explore its snowy landscapes, activities and ethnic culture. Many are from the south, where snow is rare. They brave the chilly weather to build snowmen and stage snowball fights. Over 17.4 million tourists visited Hulunbuir from January to October last year. They generated about 60 billion yuan ($8.83 billion) in revenue. 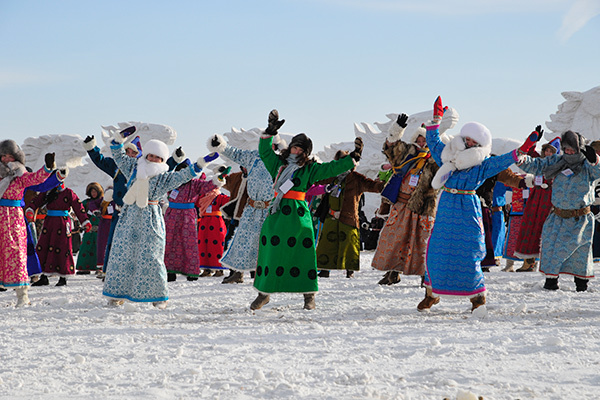 Hulunbuir recently celebrated the Winter Nadam Festival with performances of such ethnic traditions as horse riding. Nadam celebrations showcase Inner Mongolia's ethnic culture and offer an ideal opportunity for travelers to explore more of what makes Hulunbuir a winter wonderland, Xu Lin and Yuan Hui report in Hulunbuir, Inner Mongolia.